The arduous preparations of the Forerunners were not to be in vain. The Flood makes landfall on the remote planet of Seaward, which soon becomes the first to fall to the parasite upon it’s re-emergence in the Milky Way. 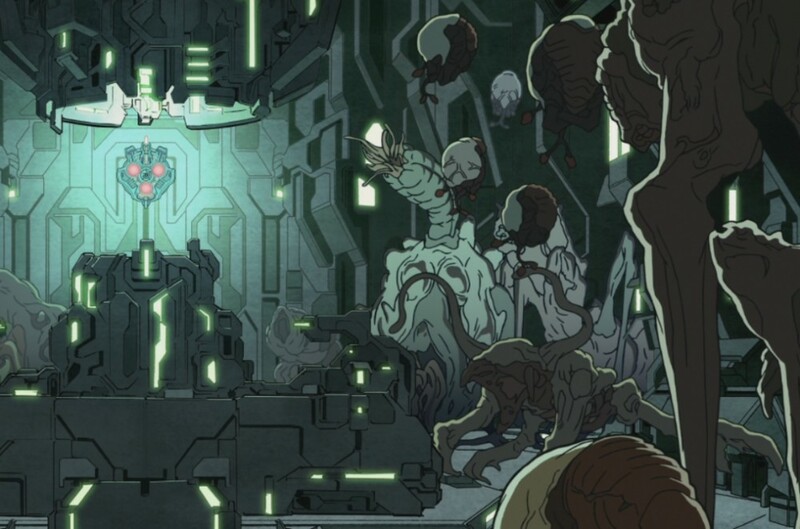 Military detachments are sent to investigate the loss of communication with the settlement, providing more escape vessels from which the infection can spread to other worlds. Over the next three hundred years, the Flood runs amok against the Ecumene. Billions of Forerunners are turned by the disease, forcing the military into asset-denial contingencies. The orbital bombardment of worlds – and even the detonation of stars – would become strategies to keep the Flood from the Forerunner’s most valuable resource: It’s people. Mendicant Bias, at the time the most advanced AI the Forerunners had ever created, is placed in charge of the Ecumene’s military including the Halo array. It is tasked with leading the fight back against the Flood, by locating, studying, and finding weakness in the parasite’s centralised compound intelligence. Breaking his pact with the Librarian to use the array as a safe haven for her specimens, the Master Builder has humans transported to Halo Installation 07 to be used as test subjects in exploring Flood infection. The tests prove inconclusive, as nearly all the humans appear to be immune to the Flood, something he can only deduce is a result of their previous victory over the parasite. Installation 07 is test fired in the Charum Hakkor system, inadvertently freeing the captive from it’s stasis capsule. The Master Builder orders it taken aboard the Halo for study, where it then begins to manipulate Mendicant Bias with it’s knowledge of the Precursor’s plan and the purpose of the Flood. Revealing itself to be the compound intelligence driving the infection, it convinces Bias to turn against the Forerunners and descend into rampancy. With the help of two human companions, Chakas and Riser, a young Forerunner named Bornstellar revives the Didact from his meditative exile on Earth. This is made possible by the ‘geas’ imprinted by the Librarian into the human’s genes at birth; the memories of their ancestors from the Human-Forerunner war, extracted by the Composer millennia ago. Eager to learn what has occurred during his exile, the Didact takes Bornstellar and the humans to Charum Hakkor. There they are greeted by the aftermath of the test firing of Installation 07, and discover that the captive has been freed. Hoping to activate more of the memories imprinted in Chakas and Riser, the group next head to the home world of the human’s old allies, the San ‘Shyuum. Not knowing what awaits them there, the Didact imprints upon Bornstellar his knowledge and memories in case anything is to happen to him. In her quest to index the species of the entire galaxy, the Librarian arrives at Janjur Qorn to catalogue the San ‘Shyuum. Fearing that a galactic cataclysm is imminent, the San ‘Shyuum attempt to rebel against the Forerunner forces after she leaves. The Master Builder orders Mendicant Bias to fire Installation 07 as punishment for the rebellion, sterilising the entire system and almost wiping out their entire race. The Didact and his companions arrive, and are captured by the Master Builder. Bornstellar is returned home, but the humans are sent to become test subjects on Installation 07. The Didact is interrogated for information on the shield worlds and AI controls, but reveals nothing. Because of this, he is abandoned to die on a Flood-infested world. The Master Builder’s act of retaliation against the San ‘Shyuum uprising makes him powerful enemies within the Forerunner political circle. Believing the rings should only be used as a last resort against the Flood, the Ecumene Council have him detained and placed on trial for war crimes. Minus the missing Installation 07, the original Halo array arrives at the Forerunner capital to await a decision on its decommissioning. During the trial, however, Mendicant Bias reappears with the missing ring and begins an assault on the capital. Now fully succumbed to rampancy, it deactivates the Forerunner defenses and takes control of the full array and the capital. Bornstellar, present to give evidence at the Master Builder’s trial, is overtaken by the imprint of the Didact and issues a verbal deactivation code to stall the AI. Despite this setback, Bias still has control over five of the rings, and begins to ready them to fire. The capital defenses recover and begin to attack Mendicant’s forces, successfully destroying one of the rings under its control. The remaining seven Forerunner-controlled rings attempt to escape through a portal to the greater Ark, but only one makes it through. Mendicant fires Installation 07, and the battle is over. The Didact’s imprint guides Bornstellar to escape through the portal to the greater Ark, where he is healed by the Lifeworkers overseeing the Conservation Measure. Upon meeting the Librarian, she reveals to Bornstellar that the Didact had been executed. Since his knowledge is vital to the fight against the Flood, his imprint overtakes Bornstellar’s body and soul, effectively turning him into a reincarnation of the Didact. The fail-safes built into Installation 07 are activated, and the ring proceeds on an automated collision course with a planet. As there is nothing either Mendicant Bias or the captive can do to stop this, they begin to gather humans (including Chakas and Riser) in an attempt to use them to manually correct the ring’s course. The plan is a success, and though the ring takes great damage, it survives. The Bornstellar-Didact and the Promethean fleet arrive and take control of the installation. The fragment of Mendicant Bias present is deactivated, and the captive caught and imprisoned once more. To save the ring, a third of the structure is discarded; reforming it to 10,000km in size. It then slips through a portal to arrive at the greater Ark. The captive is interrogated, and reveals the Flood as a test set by the Precursors to judge the worthiness of the Forerunners in inheriting the Mantle. Once the Forerunners are eliminated, humanity would be tested next; and has only survived so far as the Flood has chosen not to infect it. Enraged, the Bornstellar-Didact destroys the captive. Gravely wounded, Chakas’ mind is reconstituted into the monitor 343 Guilty Spark and assigned as caretaker of Installation 04. Eventually, Riser returns to Earth. Re-established with the Bornstellar-Didact at it’s head, the Ecumene Council defines the Maginot Sphere; a defensive line between Forerunner and Flood worlds. The Librarian consistently travels beyond the line to advance the Conservation Measure, much to the disapproval of the Bornstellar-Didact. His concerns are realised when the Flood culminates its growth, and Mendicant Bias launches all infected vessels to attack the Sphere. After cataloguing her last specimen on Earth, the Librarian is stranded there when attempts to rescue her fail. Realising the act of last resort is upon him, the Bornstellar-Didact reluctantly disperses the Halo array throughout the galaxy in preparation to fire. Offensive Bias, an AI designed specifically to exploit Mendicant’s rampancy, buys the rings the time they need to reach position. It feints battle with the Flood ships until the array activates, wiping the galaxy clean of sentient life. Quickly, Offensive mops up the remaining vessels in Mendicant’s fleet. Fearing subjugation by the rampant AI, Offensive Bias splits Mendicant’s personality core matrix into several fragments and transports them separately to the lesser Ark for study. All but one segment arrive safely. Later, the Conservation Measure is enacted, and ships leave the Arks to spread life throughout the galaxy once more.